Northeastern Technical College's Dillon Campus doubled in size in 2010 with the completion of the 200 building. This new wing houses two classrooms, a large computer lab and state-of–the-art biology lab. Students interested in pursuing programs, such as nursing, which require biology labs, can now take these classes at the Dillon campus. 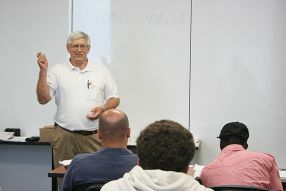 The Dillon campus offers both distant learning and traditional classes. The campus is open Monday through Thursday from 7:30 a.m. to 4:30 p.m. and 5:30 to 8:45 p.m.; Friday from 8 a.m. to 1:30 p.m.
Twenty-five people earn industry-recognized credentials that will help them get better, higher paying jobs. CRJ and CNA Program now in Dillon County!